Frogling scholars insist that humans are, by rights, "Hu-lings". The hu was a small, pink, extremely ugly creature that resembled a naked mole with hideous teeth and patches of greasy fur. Just as froglings resemble frogs, so did humans resemble the hu. They also insist that humans exterminated the hu out of a sense of shame. According to various satirical poets, the hu was a greedy, wasteful, promiscuous, puritanical, and stupid creature. Elves are to humans what humans are to the (possibly mythological) hu. Take a human and fix the mistakes. Organize teeth. Fix eyesight. Improve hearing. Improve skin. Build in a resistance to disease, age, and fear. Clean up the chaos of the mind. Elves are humans 2.0. They are better than you because they were designed to be better than you. And they are beautiful, like moonlight or the lure of an anglerfish. Elves live in Foreign Parts. They are never from around here. No nation ever has an elf neighbor, but nevertheless, the elves surely must have nations. You can even visit them, if you have a guide. They are built in the most unlikely and beautiful locations in Creation. Climb a winding mountain pass, and then climb six other mountains, and you might find a tiny elf village at the end, without roads or stairs. The elves farm in glass gardens and eat rare fruits. They live in birdcages. They don't worship the Authority but they do respect him. They cannot do anything practical: no practical shoes, no sensible hats, no ordinary architecture. Everything must be Art. High Elves are to humans what humans are to ants. Elves are their interpreters, or their pets, or their experiments. They own beauty the way merfolk own the sea. Anything beautiful is theirs by right, to be claimed by sovereignty of nature. 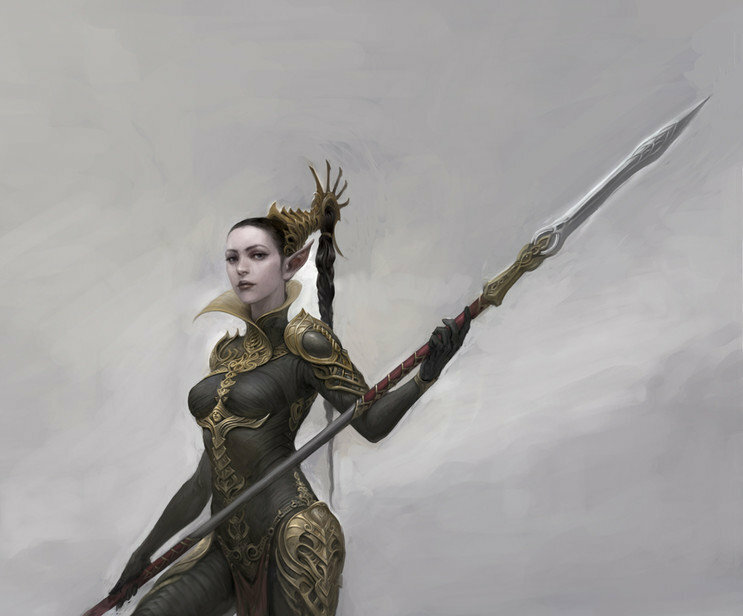 High Elves are purely magical, in the same way dragons and unicorns are magical, and they are so mysterious, aloof, alien, rare, and dangerous that they might as well not exist, from a gameplay point of view. Write them in as needed. They have goals and agendas, but not ones you can understand. If you're an Elf, you either work for a High Elf, or you've escaped or fallen from your birdcage. Being an Elf is the best. Being an Elf Wizard is even better. The bow is more important than it sounds. As a low-level elf wizard it will be your only source of damage. The extra MD can potentially be amazing. There aren't many ways to get extra MD in this system and 50' trees are surprisingly common. But here's the big downside. Sleep rough, wake up grubby, and stop being an Elf Wizard for the day. Lose a leg? Get a bad rash? You're effectively demoted. Watch out. 2. Any target you hit with an arrow counts as being at range “Touch” for the purposes of your spells. 3. Touch a wound to prevent it from bleeding. You do not negate any damage, but you to stop blood loss (and remove the Blood Loss condition). Faint white scars will still form. Your cantrips are decent. The 1st has many uses. As one of my players said, "When the donging stops, the elf is dead." In this setting, spells are creatures. Wizards have brain-guns that shoot bullet-ferrets. Elves do things a little differently. Their spells are naturally generated, symbiotic creatures bound to their soul and substance. They still need a spellbook, because you want to keep your spells safe, but their books are elegant gossamer creations embroidered with platinum thread. An Elf Wizard is like a magical sculpture garden or a music box. They are made for entertainment. To a High Elf, that can mean a lot of different things. Some of these are stolen from Goblin Punch. Target makes another Save against a emotion-affecting effect (fear, anger, sadness, pleasure, pain). This can affect yourself. Elves view the world through schoolteacher eyes. You can talk to a bird, and it can talk back. If there is a party of 3-6 adventurer's moving through the forest nearby, a random songbird has a [sum]x10% chance of knowing where they are and if they're doing anything extra weird. Birds of prey are rarer, but more observant. It's "speak with birds" not "make friends with birds". Your average forest songbird will happily sit on an elf's shoulder and tell them all sorts of Disney-branded secrets. Your average mountain eagle will show up, demand food, scream at you about politics and all the people and sheep it's killed, and then leave in a huff. Touched plant flourishes. Seeds germinate, flowerbuds swell and bloom, and a sickly plant regains vigor. Heals [sum] HP to a plant creature. If cast on a fruit, the fruit will grow up to the maximum normal size or 2x as big (whichever is smaller). Yes, you can use this to double your rations, as long as your rations are fruit or vegetables. Elves, in this system, also eat half the usual rations (1 per day rather than 2). Using it on food would be a shame though. Touched creature is cloaked with an illusion that makes them appear to be in their physical prime. Elves age slowly, but their last few decades condense a lifetime of ugliness. This spell cloaks you or your companions. You'll probably want to cast if before meeting a High Elf. Remember, you can't "see through" illusions, but you can pop it with a good solid blow. Name a common animal. You now know where the nearest example of the animal is. Oh hooray. If the areas is infested with manticores, they count as common creatures. You are surrounded by the harmonious sounds of a five-piece band for the duration of the spell. The exact instruments vary caster to caster, and the unseen band can play any song you've heard before. It cannot duplicate speech. You can also opt to center the effect on an adjacent location, rather than on yourself. Bear in mind that you start with 2 of the 6 spells listed above and a bow. Good luck, Elf Wizard! Flowers (caster chooses the type) erupt from the target's wounds. Target takes 1 damage for every point of damage it has already taken, not exceeding [sum]x2. Save for half. If this damage kills the target, their corpse is entirely consumed by plant growth, and turns into a beautiful tree covered in flowers. Height is 2d4 x creature's HD in feet. And then, possibly as soon as Level 2, Elf Wizards go from "princess jukebox" to "double fireball to the face". Bear in mind that with the bow-related cantrip you can hit a target with an arrow, deal 1d6 damage, and then cast this spell to (at a bare minimum) double your damage. You also get a tree out of it. Target made more beautiful. Dirt falls away, pimples disappears, teeth whiten, lice vanish, gouges fill in, and varnish looks new again. Will also restore 1d4 points of Charisma if damaged, to former max. While Illusion of Youth is merely an illusion, this is the real deal. You won't get any younger but you and the things you own will look as good as new, or possibly better. Expect Elf Wizards to cast this on themselves openly (just in case), and on their allies (secretly, if required). Target takes [sum] + [dice] damage, no save. As an Elf Wizard, you have to fire this spell using a bow. The spell is the arrow. I don't have much to say about Magic Missile, except that it's clearly an Elf spell humans domesticated. [Sum] enormous serpents of HD 1d4 crawl up from the dirt. They have Attack 13, Defense, 13 and deal 1d6+HD damage, except for the 1 HD serpents, which are small and bite for 1 damage + deadly poison. Serpents are not controlled by the caster. They're just pissed off snakes. The Authority buried the Primordial Serpents deep within the earth, but Elves know how to call them up again. This is not always a wise idea. Does [sum] damage, Save vs. Charisma for half. Like a fireball, but the flames are purple and gold. Creatures with 17 or more Charisma, non-sentient creatures, beautiful objects, the dead, or other Elves are immune to this spell. More straight up-damage... or is it? I'm sure there are other uses for this spell. Does [sum] damage. As fireball except that the caster fires an arrow into the air (which turns into a multitude) and the damage is all piercing damage. Doesn't work in places with low ceilings (less than 100'). Another straight-up damage spell. Really, you're only likely to pick this one if you aren't taking Elegant Judgement or Magic Missile. It's here to give you options. If an Elf Wizard can survive to Level 4, they will become one of the more formidable damage-dealing casters in the game. Early levels do not give them tools for survival. It's a very risk-reward setup. Nothing too shocking here. This is one of the less harsh mishap tables. 3. Lose the ability to cast spells permanently. You can wield only your nails and teeth. You can only speak in monosyllables. The Doom list is less forgiving. You slowly regress to a less enlightened form. Your carefully crafted substance is unraveling. 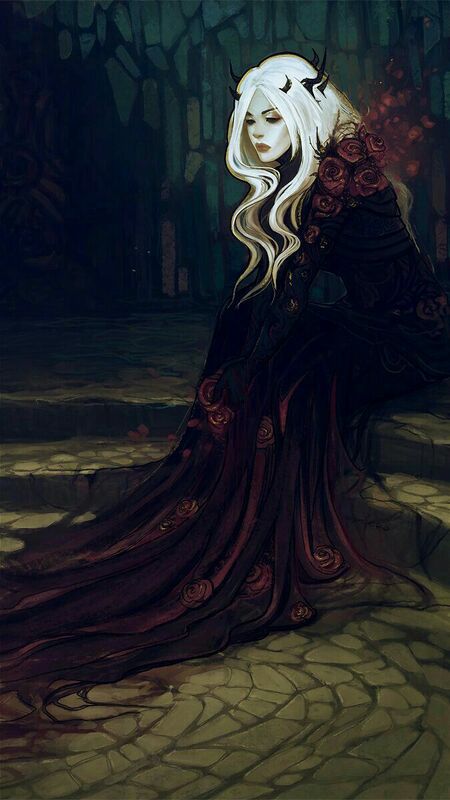 The magic of a High Elf can save you, or your own sense of beauty and truth will keep you together. Otherwise, you'll collapse at the seams. How exactly do you use the bleeding cantrip? It's not like your DaDT has entries for blood loss. I've just been ruling that it grants a bonus to rolls trying to remove fatal wounds caused by slashing weapons, but I'd be interested in what you had to say. It's just for cleanup. It makes wound less icky. Still deadly, but it doesn't stain your clothes.